Google’s big Gmail redesign was the talk of the town on Wednesday, and rightfully so. The new graphics and layout that are currently rolling out to Gmail users represent the biggest redesign Gmail has received since the free email service first launched 14 years ago. The new look is far more modern than the old design, and Google’s updated features have been lauded by users. The Gmail redesign is rolling out to users in stages, but there’s a good chance you already have access to it, even if you don’t realize it. On the Gmail home page, click the gear icon near the top-right corner and you might find a new option at the top of the list labeled “Try the new Gmail.” Click it and you’re good to go. There’s a lot to digest with Google’s redesigned Gmail app, and we told you about the most popular new features in yesterday’s coverage. There’s one feature in particular that got a major overhaul though, and it deserves some extra attention because it might be one of the most underutilized features of Gmail. Below, you’ll find a breakdown of our five favorite things about Google’s new Tasks app. Unlike the Tasks function in the old Gmail interface, the new interface makes Tasks available at all times. There’s a new add-ons bar all the way on the right side of the screen now, and there are three icons included by default. The first is Google Calendar, the second is Google Keep, and the third is Google Tasks. You’ll get a quick walk-through the first time you click it, as seen above. Then you’re ready to rock. One of the big barriers to adoption for Google Tasks was the lack of a dedicated mobile app. Now, that issue has thankfully been remedied. 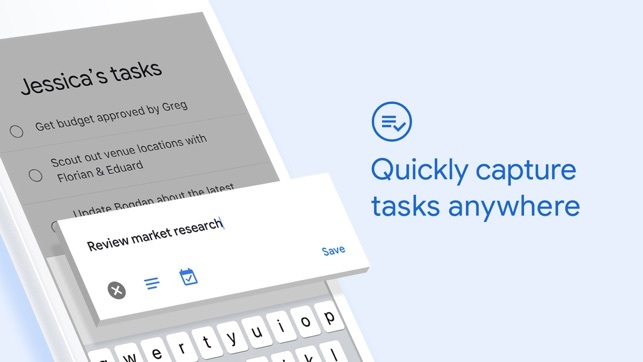 You can download the free Google Tasks app from the Google Play store or from Apple’s App Store. Not every task belongs in the same bucket, so Google Tasks lets you create and manage multiple task lists. This way, you can easily separate like tasks into groups — if all your tasks are in one list, there’s a good chance things will get lost in the shuffle. To switch between lists or to create a new task list, just click on the name of the current list in the top-left corner of the Tasks add-on. Tasks apps are a dime a dozen these days, and developers often try to separate themselves from the pack by introducing all sorts of added features. That’s nice in some cases, and added functionality can certainly be useful. But the problem is that these apps can become overcomplicated, which has the potential to make you less productive. Google Tasks keeps things simple, and that’s one of its biggest strengths. The fact that it’s integrated into Gmail — and the fact that there are now mobile apps available — makes Google Tasks a no brainer. Why bother with a separate Tasks app when there’s one built right into the email app that’s open all the time in your browser? Since Google has that big advantage over the competition, it doesn’t have to complicate things with overbearing features that likely only appeal to a small subset of users.